I thought we'd talk a little about bullet journaling. So what exactly is a bullet journal? It's a calendar, to-do's, a book of lists and notes. You can use it for whatever you want, all you need is a notebook and a pen. So a BuJo is not a product but a system one can use to organise one's life; the system was created by Ryder Caroll and it's basically just to keep an overlook on your year, month, week and day, to write down tasks, notes and to be able to move things forward if they're not done by the end of the month. After the creation people are customising their BuJo's; for example some write down their goals for each month, track their moods and habits and some, myself included, use it to have a creative outlet with drawings and calligraphy. 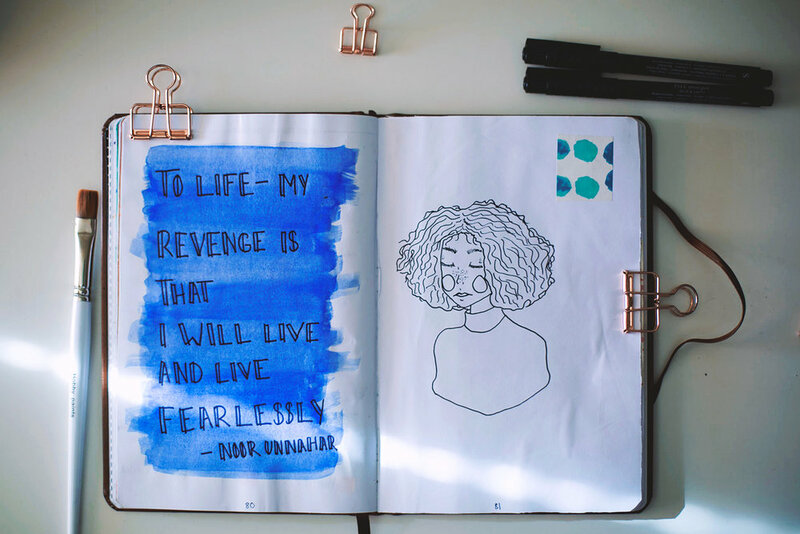 "To life - my revenge is that I will live and live fearlessly"
There is a lot of different ways to be creative with your BuJo, there's stickers and washi tape and watercolour if you feel inclined. There's also a multitude of pens to use; I have a little collection of both washi tapes and pens and I keep them all neatly stored on my desk. I like my weekly spreads, or sometimes two weeks per spread - currently my days are very similar and there's often not a lot of time for stuff outside of work. That doesn't stop me from journaling though, I just fill my pages with drawings and lists of things. For example I have a list of all the movies I want to watch and when I've watched them I cross them out and give them a rating out of 5 using yellow dots. I also am fond of the trackers, they're a great help to track my pain and also bad habits such as junk food and spending money. There's a lot of different notebooks/journals you can use; the most common one is a dotted notebook. For my first and current journal I chose a unlined one, it's worked well for me but it's harder to keep everything straight. A dotted journal gives you the feel of a unlined one but helps you keep everything even. I am going to get a dotted journal for my next BuJo. There are lots of guides and people explaining this in more depth all over the internet. (Ryder explains it in a video here for example) My best advice would be to check out youtube, tumblr, instagram or pinterest for all that and inspiration. Hopefully I got you interested in bullet journaling, or at least ignited a little spark. Now I'm going to brew myself a cup of tea and continue my binging of Criminal Minds.